Twisted tubular herringbone is a variation of regular tubular herringbone stitch. It is also known as twisted Ndebele rope. Like many other bead stitches, there is a flat version of herringbone stitch as well as a tubular version. 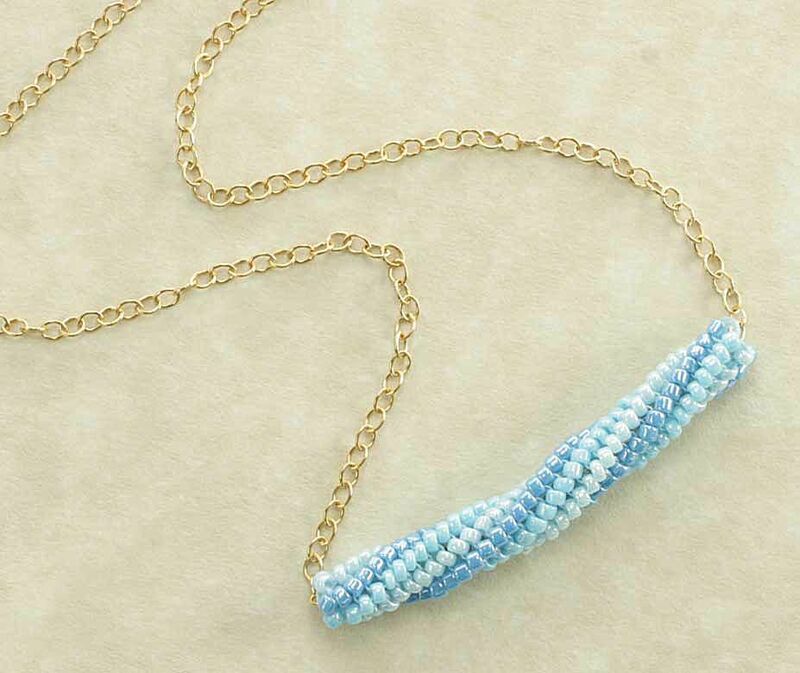 Using twisted tubular herringbone, this tutorial will show you how to make a tube bead that looks great when strung on a cable necklace chain. This bead stitch works up fast and is a great way to learn twisted tubular herringbone stitch. Before you begin, it's a good idea to review the technique for straight tubular herringbone stitch. My spiral tubular herringbone bead is made with three different colors of size 15 Miyuki round seed beads. You can use larger size 11 round seed beads, but it will result in a larger tube bead. The beads and supplies listed below are enough to make one tube bead pendant. This tubular herringbone project will use the pattern on the left. We'll begin reading the pattern at the bottom with a six-bead round of ladder stitch. One thing you should notice is that the pattern columns are straight, whereas the completed beaded tube has spiraled columns. The reason for that is because the spiral gradually forms on its own as you stitch each round, beginning with Steps 8 and 9. After preparing your beading thread, make a row of ladder stitch of 1A, 1B, 1C, 1A, 1B, and 1C. Join the first and last beads in the ladder together by passing the needle down through the first bead (A), and then up through the last bead (C). Pull the thread taut to form a ring that serves as the first round of tubular herringbone stitch. The second round is done in regular tubular herringbone stitch. For each stitch, pick up two beads and stitch down into the adjacent bead. Push the two beads apart so they stack into two rows on top of the base of ladder stitch. Refer to the thread path in the picture. To create the stripes shown on my bead, make sure the same color beads are stacked on top of each other. After you have stitched the first three pairs of beads, you're ready to step up and begin the next round. To step up, pass through the next two beads rather than the usual one bead. That will put you in a position to add the next pair of beads. That pair becomes the first pair of beads in the next round. Continue stitching tubular herringbone stitch, stepping up, to begin with, each new round, until you have a total of four rounds completed. The initial ladder stitch ring is included as one round. The fifth round is when you will begin making the tubular herringbone stitch twist. The twist occurs when you stitch through an additional bead in the column when you are making the step up at the end of the round. Begin the fifth round by passing up through three beads, rather than two. You do this by stitching up through the first bead from the prior round and the two beads stacked on top of it before adding the pair of beads for the new row. The image on the left shows the three step-up beads passed through, plus the first pair of beads for the sixth round. After you add the first pair of beads in the fifth row, bring the needle up through the next herringbone spine by passing through two beads, instead of one. From this point on, do this with every stitch, with the exception of the very first stitch in each round, where you step up through three beads (see Step 8). Continue stitching twisted tubular herringbone stitch until you have a total of 34 rounds, including the initial ladder row. Alternatively, you can stop stitching rounds when your tube is about 1.5 inches long. Reinforce the very last round, shown on the left, by passing through each bead again, using a ladder-stitch thread path. This tightens up the beads at the end of the tube and gives the last round a similar appearance to the first round. After weaving in and ending all of your thread tails, you're ready to string your pendant. Begin by folding the 20-gauge wire in half over the chain. Then use your fingers to gently twist the two halves of the wire together, as shown here. Pull the folded wire all the way through the beaded tube. Then, gently untwist and remove the wire, and center the tube along the chain. Use the pliers and jump rings to attach your choice of the clasp to the chain, and enjoy your new necklace!